Monday and a new card for Kortskissen. I made a card with a bokeh effect. I got inspiration from the colors on this weeks sketch. Hope you have a nice week and get some time for paper crafting! I made another card this week. 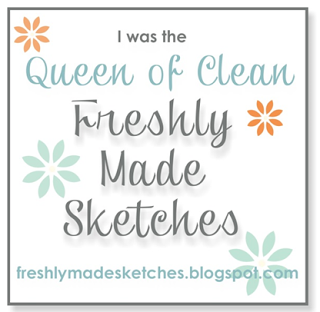 I got inspiraton from the challenge at A blog named Hero to use Kraft + white + one color. I got the stencil from Hero Arts a few weeks ago and I really wanted to create a background whit it so this is what I came up with. It's time for a new card with stamps from Two Paper Divas. I used a sketch from CASE(e) this Sketch #145 and different sentiment stamps from Two Paper Divas. It's time for a new sketch and card for Kortskissen #327. 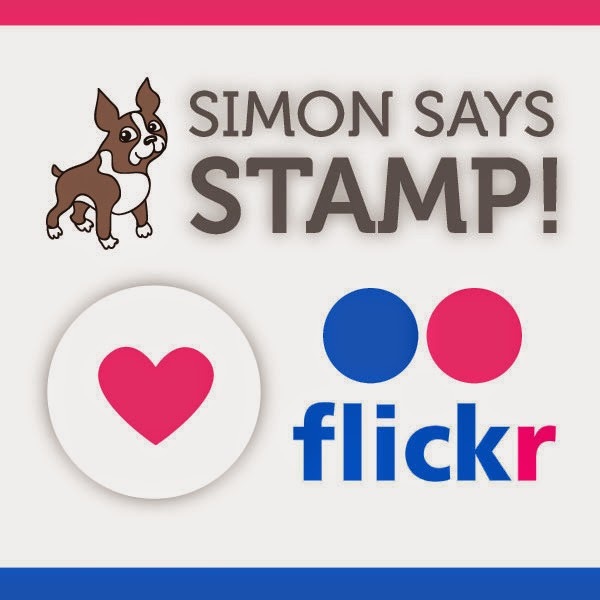 I used papers and stamps from an old Simon Says Stamp card kit. Please visit the blog at Kortskissen for some more inspiration, Kortskissen #327. It's time for a new card with stamps from Two Paper Divas. I used some of the smaller stamps to create my own background. The mistletoe is colored with Polychromos colored pencils. Hope you had a nice weekend. 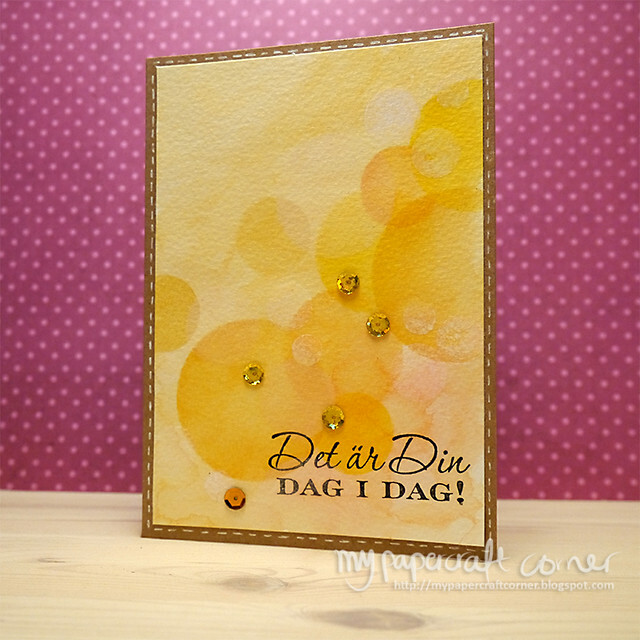 Now we start a new week with a new card based on a new sketch from Kortskissen #326. 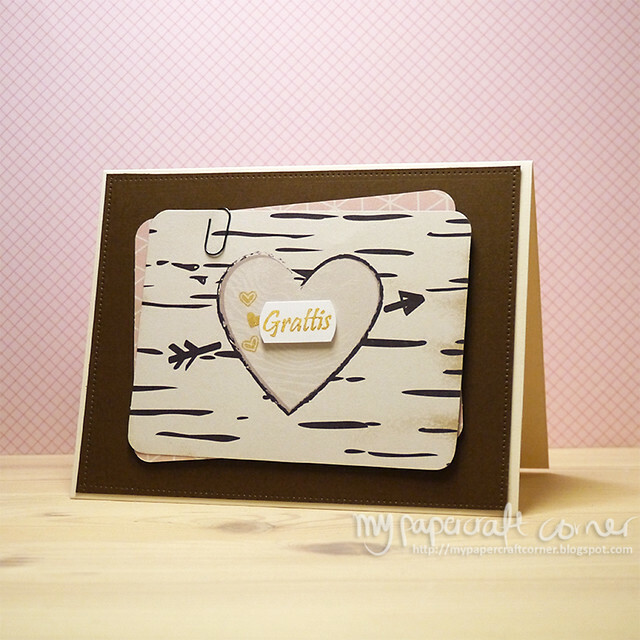 I used some heart stamps and journal cards from Simon Says Stamp card kit October 2015. 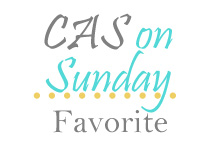 I also used a border die from Lawn Fawn and a sentiment stamp from Vilda stamps. I saw the challenge at Addicted to CAS and I wanted to make a card with sparkle and use the new stamp from Two Paper Divas. So I came up with this. 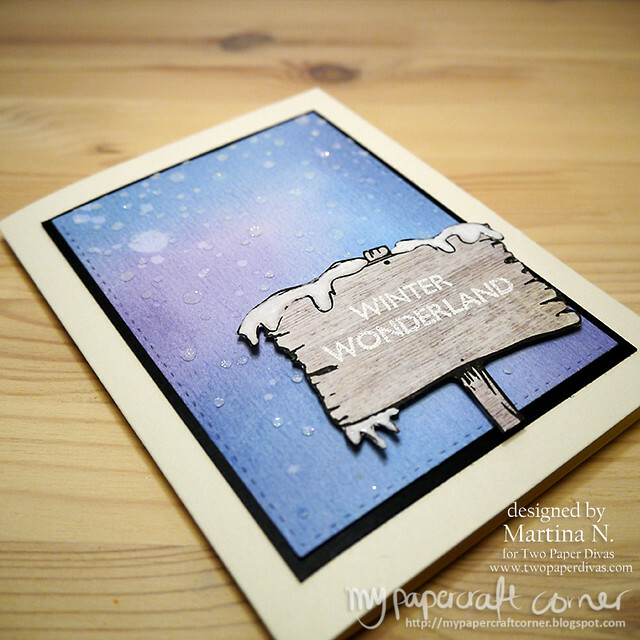 I used a patterned paper for the stamp and used some Enamel accents for the snow. 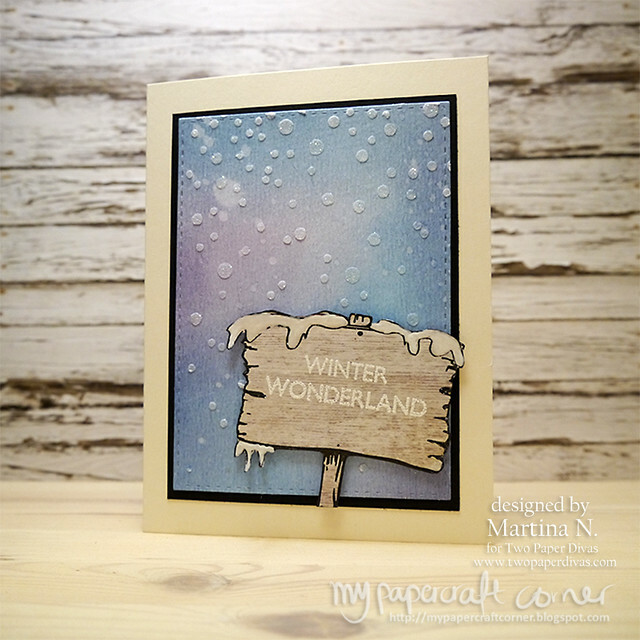 I used a Simon Says Stamp die and Distress Inks to create a winter background. I then used a stencil and embossing paste with a glitter embossing powder to create some sparkle. Have a nice day and weekend. Today it's time for a new sketch from Kortskissen #325. I got the new October card kit from Simon Says Stamp this week so I wanted to play with it and came up with this card. Today it's time for the October release with new stamps from Two Paper Divas. 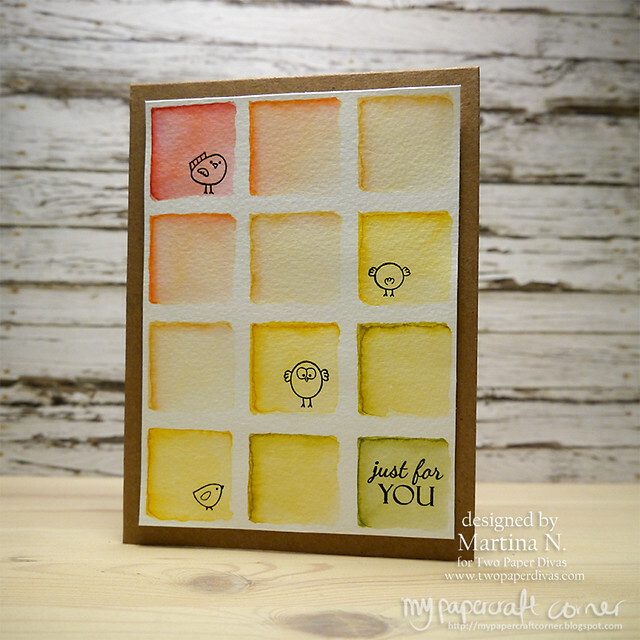 I made this card based on the first day at Online Card Classes called Watercolor for Card Makers: Exploring Mediums. I created my own shapes and used my Distress Markers to color the squares. I then used the birds from the cute stampset Christmas Clothesline from the October Release. I love the birds.